I love travelling because of all the new things I get to see, do and of course, eat! Foodie adventures are adventures of the most delicious kind, don’t you think? 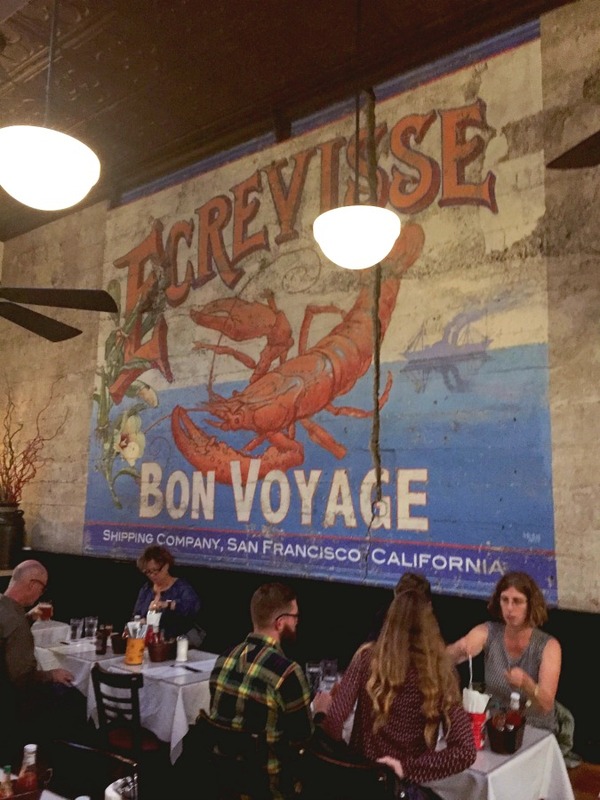 This isn’t the first time I’ve explored the food of San Francisco, have you checked out my eight great foodie finds downtown? If you’re a regular round here, you know I take my ice cream appreciation very seriously and if like me, you scream for ice cream, you’ll want to get the inside scoop on 10 of the Best Ice Creams in San Francisco. 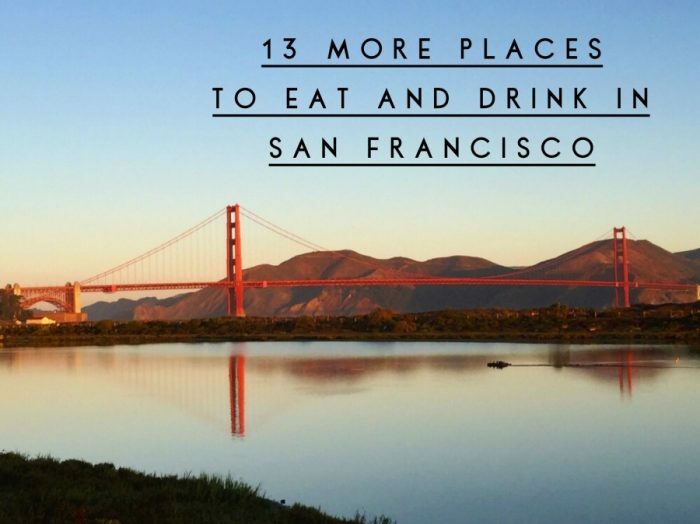 For now though, won’t you join me on a virtual food tour of San Francisco? I’ve covered all the tasty bases with everything from donuts to dumplings, shrimp to schnitzel and pretty much everything in between. Let’s tuck in! I’m only including one bar in this post, so I’m making it a good one. 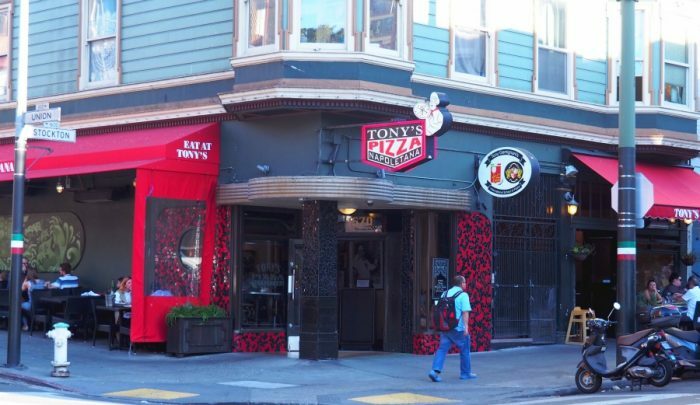 If you want to see more of my favourite watering holes, check out these 7 Must Visit Bars in San Francisco… And then add Toronado to the list. 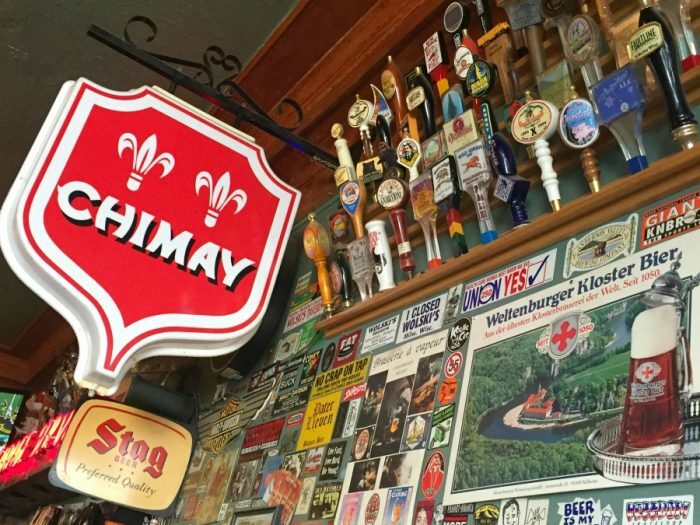 With over 40 beers on tap, this place is famous for it’s amazing beer selection. It’s super popular and so down to earth, it’s almost grungy. Don’t bother asking for recommendations from the bar staff because their recommendations like their smiles are not very forthcoming plus all the beer here is first rate. You don’t have to worry that the service is exceedingly average, you’ll be enjoying the beer too much to notice. Drinks are reasonably priced, dogs are welcome and there’s a great vibe. It’s cash only and there’s no food but feel free to pop next door to Rosamunde Sausage Grill and bring your own! Our driver in Hawaii gave us the heads up on this San Franciscan institution and we’re jolly pleased he did. Founded in 1947 by Tommy Harris, this place is still as popular, seventy years on. 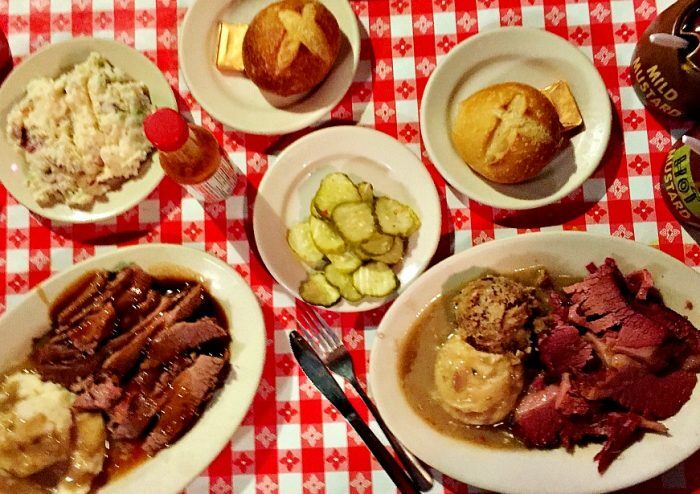 There’s a huge beer selection, kitsch galore, a plethora of memorabilia and a very meaty menu. We loved the whole experience at Tommy’s and not just because there was a serve yourself pickle bin. 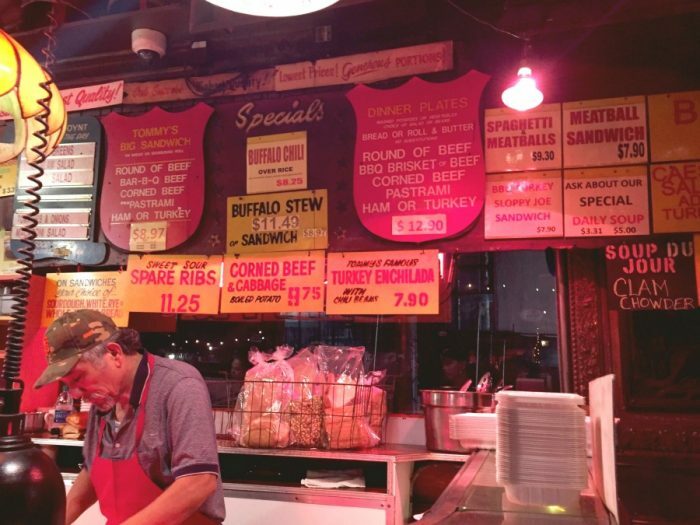 A visit to Tommy’s took me back to my school dinner days – you line up, you order, you pay, and then find a seat at one of the red and white chequered tables. There are no frills, no airs and no graces here just honest to goodness homestyle food and some delicious daily specials served in uber generous portions. We each had the large plate which was a massive amount of food and at $12.95 was exceptional value. It’s open all hours, cash only and has to be the best value in town! Although this is not a sit down restaurant, it would be somewhat remiss of me to talk about San Fransiscan food without talking about Bob’s. 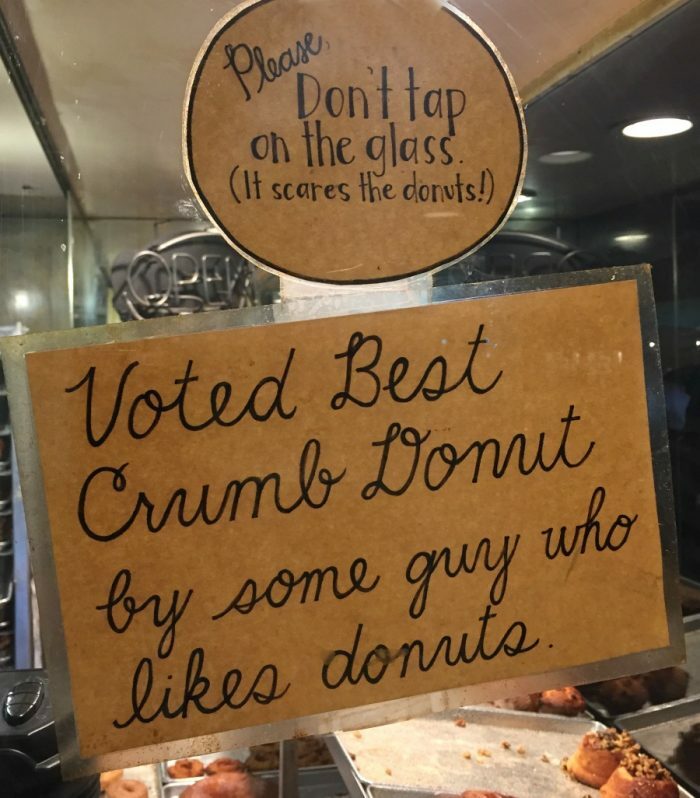 This donut mecca has been keeping San Fransiscans in donuts since 1960 and not only is it still going, it’s open 24 hours a day which means you can have donuts for breakfast, lunch, dinner or even a late night snack. There is a huge selection on offer but it’s worth asking one of the friendly staff for what is fresh or nearly fresh. Whatever you do, don’t leave without one of Bob’s famous apple fritters, they are especially spectacular – fresh, fluffy and full of apple chunks. 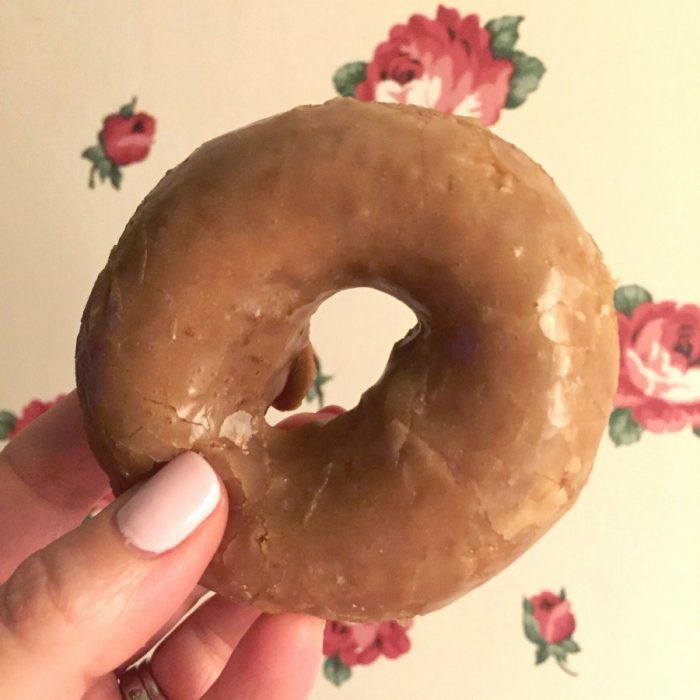 Side note: The apple fritter is more delicious than it is photogenic, so here’s a picture of my glazed donut instead! Here in the heart of Little Italy is the home of 12-time World Pizza Champion Tony Gemignani. Scoring a table here isn’t always easy, but it’s always worth it. There are no reservations here and everyone in your party needs to be in situ before you can even put your name down for a table. The best advice I can give you is that the earlier you arrive the better it is, or at least the less time you’ll have to wait for a table. The range of pizzas is deliciously mind boggling – you really will be spoilt for choice with every kind of pizza from Grandma to Gluten Free and Sicilian to St Louis, with pretty much everything inbetween. We went for a Gold Medal Coal Fired New Yorker and it was fabulous from the crust to the topping. Service is friendly and efficient and there’s a lively, bustling vibe. 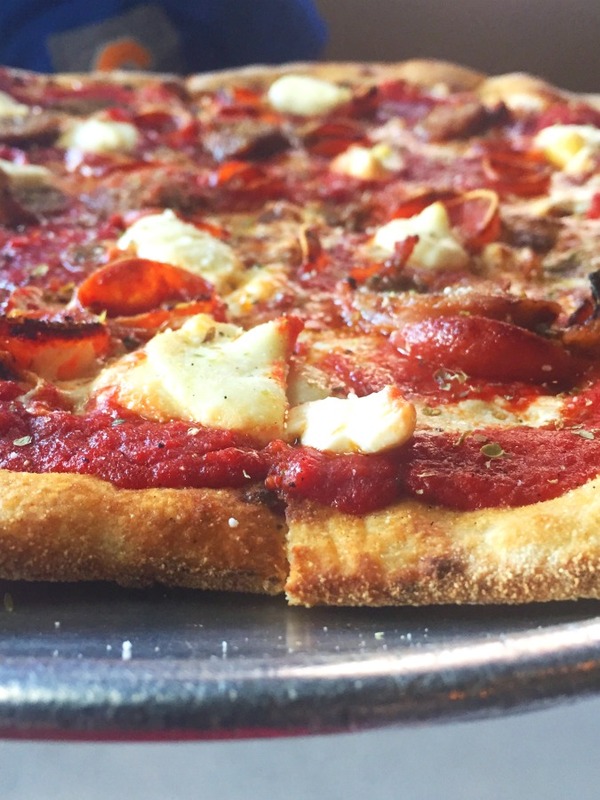 If you like pizza, you’re going to love Tony’s! 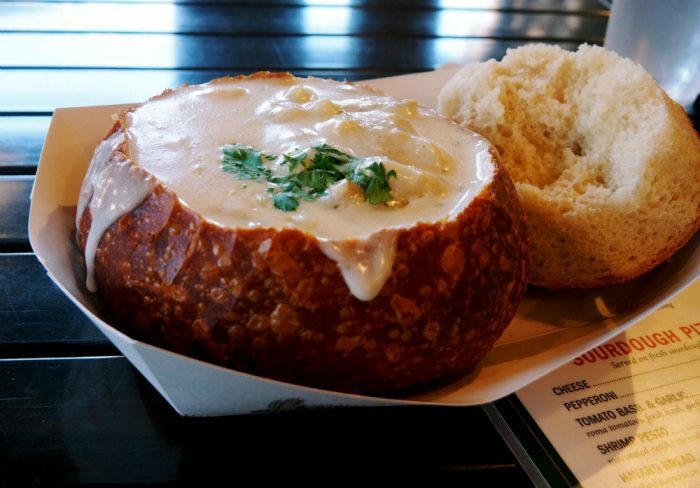 There’s no denying the Boudin Bakery at Pier 39 is totally touristy but it’s worth a visit for the a bread bowl full of clam chowder alone. It’s hearty, it’s delicious and it’s at just under $8 a pop, it’s reasonably priced too. Be sure to check out and save some stomach space for all the amazing baked goods (including the animal shaped bread) and other tasty treats too. 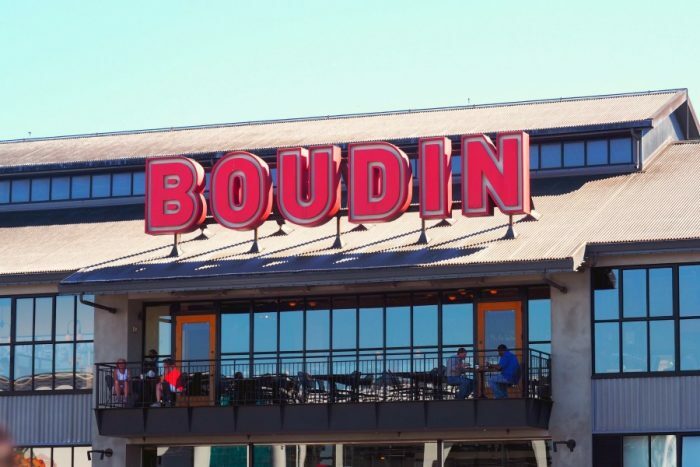 There’s a bigger and slicker Boudin branch across the way at Fisherman’s Wharf complete with a demonstration and production bakery and a bakery museum! The original Boudin bakery building fell to the ground after the earthquake and subsequent fires in 1906. It was lucky that Louise Boudin escaped with her life and some of the sourdough starter in a bucket. Just think, when you take a bite of Boudin sourdough, you are actually chowing down on a bit of Gold Rush history. Located in the Daniel Libeskind designed lobby of the Contemporary Jewish Museum which is worth a visit itself, your belly is going to love this deli! 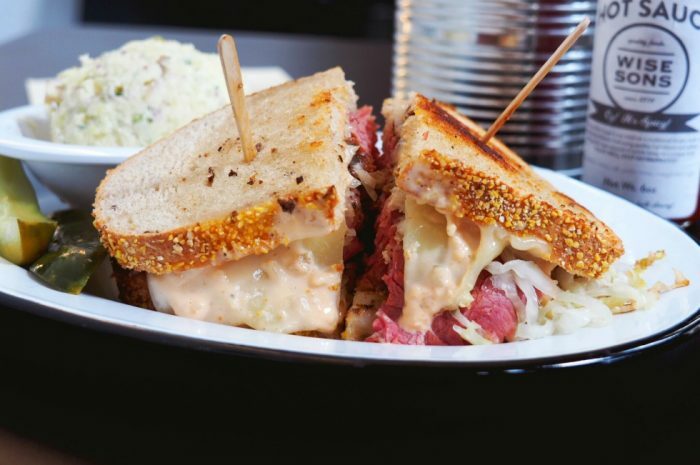 I actually wanted to order everything on the menu – there’s heaps of sandwiches, bagels, salads and even matzo ball soup – but as I was on my own, I settled for the Reuben and it didn’t disappoint. The pastrami is piled high and some of the best I have ever tasted. 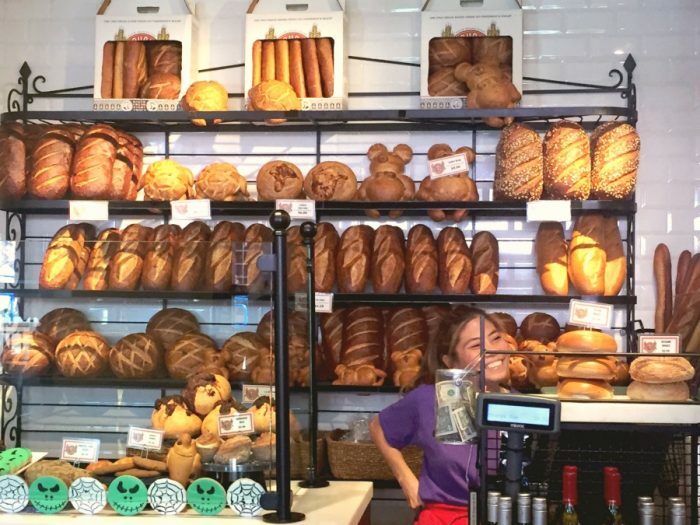 There are heaps of Jewish groceries available for sale plus bread and bagels. 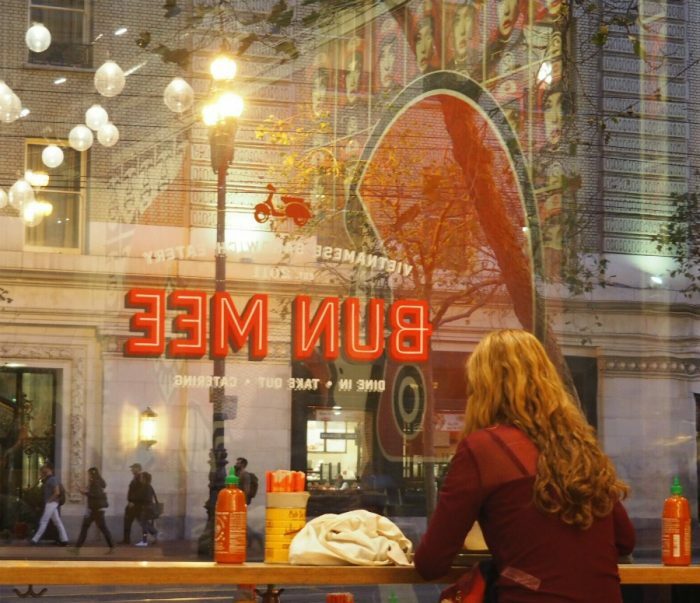 There is plenty of seating indoors, outside on the patio and there’s a take out window too. Nestled in the heart of Chinatown, this hole in the wall shop is so small you would almost certainly miss it if it wasn’t for the long line of locals, regulars and tourists waiting for their dumpling fix. Be ready with your order because although the line can be long, the patience of the staff is short! 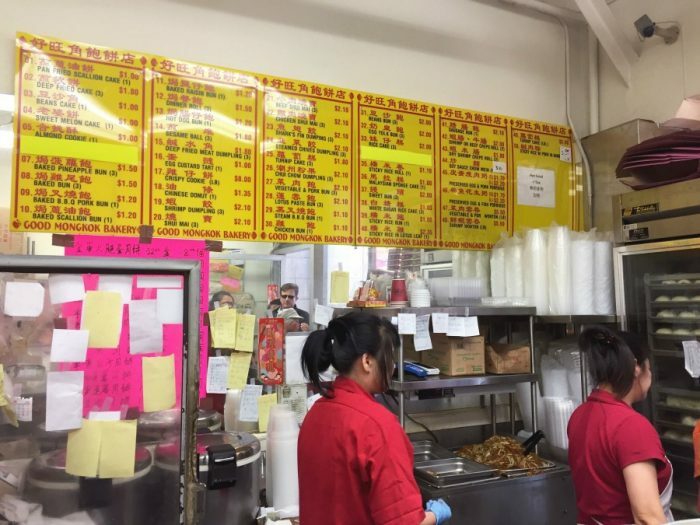 The menu is in Chinese and English but if you’re not sure what to get, check out what everyone else is getting and if all else fails, you can’t go wrong with the dim sum. This are some of the biggest, most delicious and cheapest dumplings I’ve ever eaten. The shu mai were massive and the prawn dumplings were also big with plump juicy prawns. 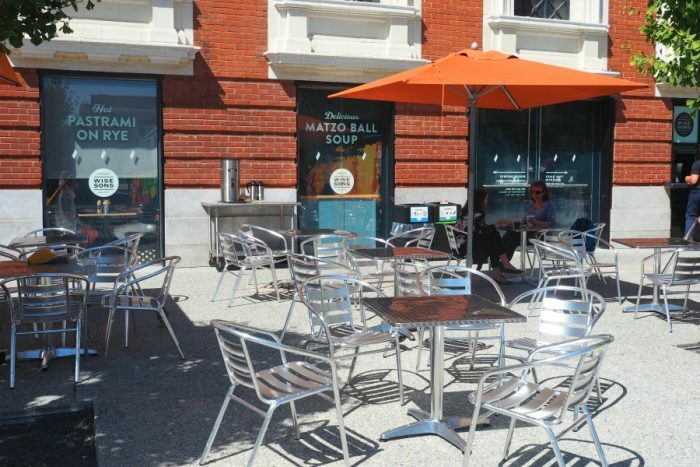 There’s no seating here so grab your food to go and head to Portsmouth Square. 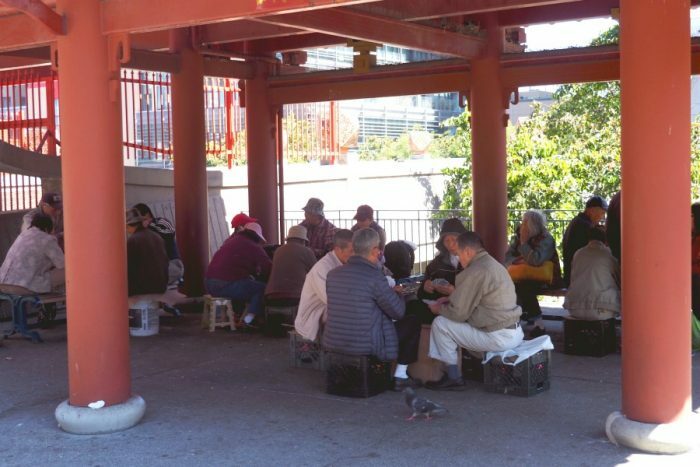 Known as “the heart of Chinatown,” here you’ll find a number of statues and markers commemorating famous people and events and what seems like most of Chinatown playing mahjong. With a small but perfectly formed menu, the big draw card at the super popular pizzeria are the wood fired Neapolitan pizzas which are so thin and crispy, and the appetizers are fantastic too. There’s a great wine list, friendly service and cool vibe. We stayed in the hotel next door and whatever time of day we passed by when the restaurant was open, it was always packed. They accept walk ins but if you don’t like waiting, you can book ahead. 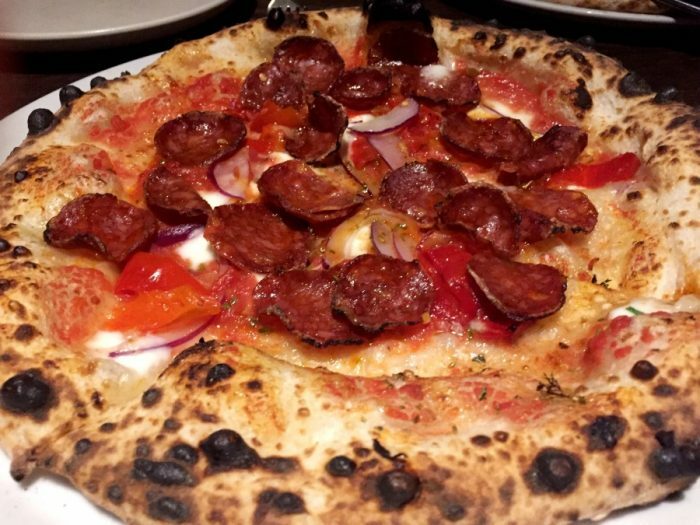 You don’t have to be a pizza lover to love Del Popolo! 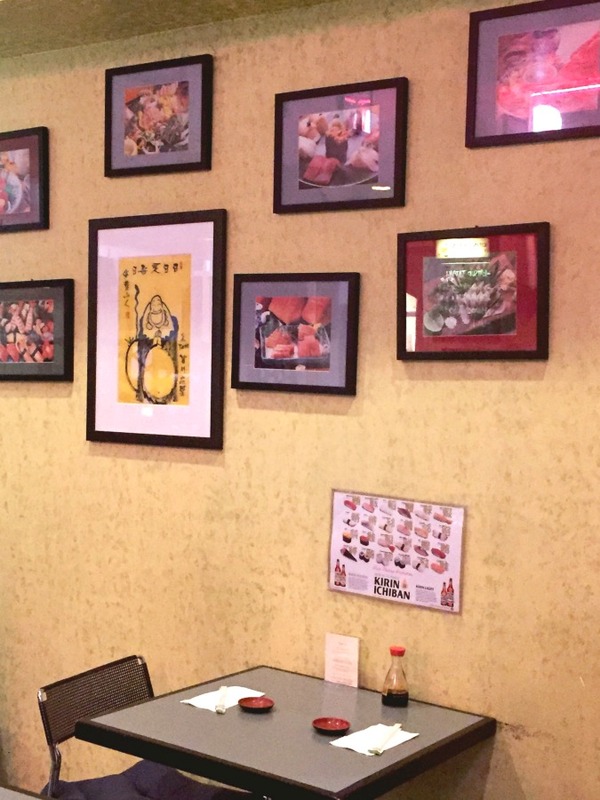 This neighbourhood gem doesn’t look much from the outside but inside you’ll find delicious, fresh sushi and friendly service without breaking your budget. There’s a varied menu which also features sashimi and some hot Japanese dishes but we only had eyes for the sushi rolls. 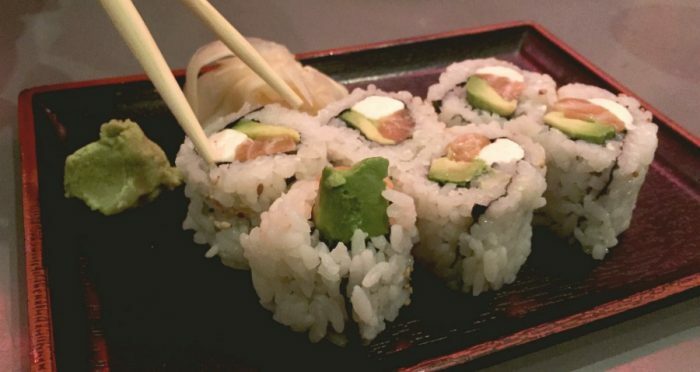 The Philadelphia Roll with tuna, avocado and cream cheese was our personal favourite. It’s quite compact inside with both bar and table seating, but service is friendly and it is open late which is super handy. You have to love a restaurant whose motto is “Anytime is Dumpling Time.” Those are words to live by indeed! 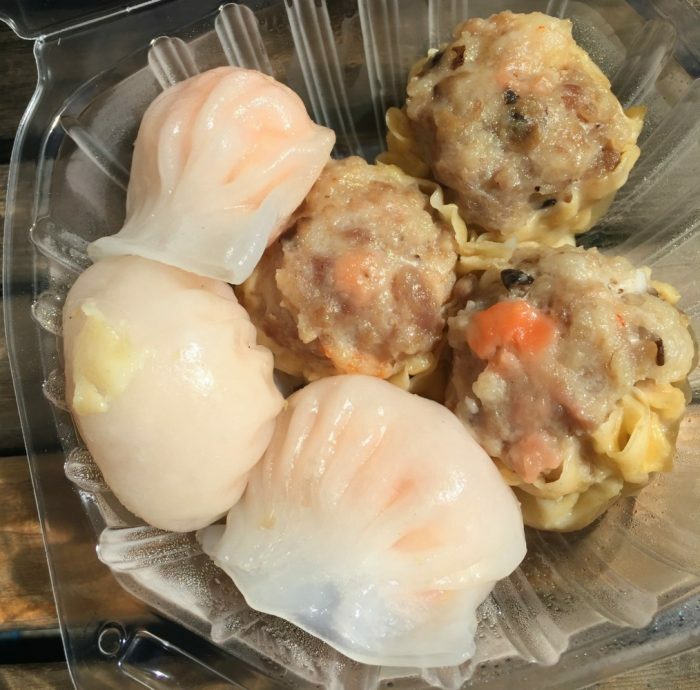 Dumpling Time is totally worth the short Uber ride from downtown, and the wait in line – my tip is to get there early to avoid feeling hangry. 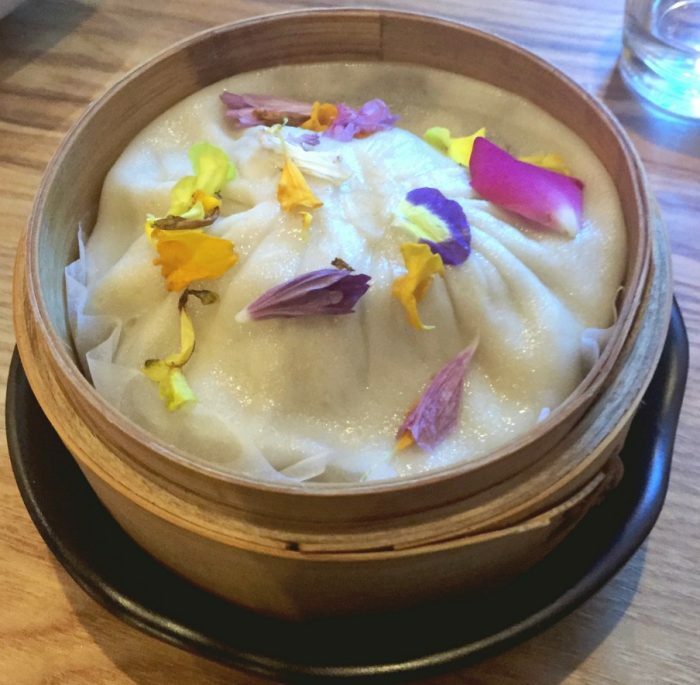 The space is fun and contemporary, the service is super friendly and you can watch dumplings being made right before your eyes. We went in a big group so got to try almost everything on the menu and loved it all. 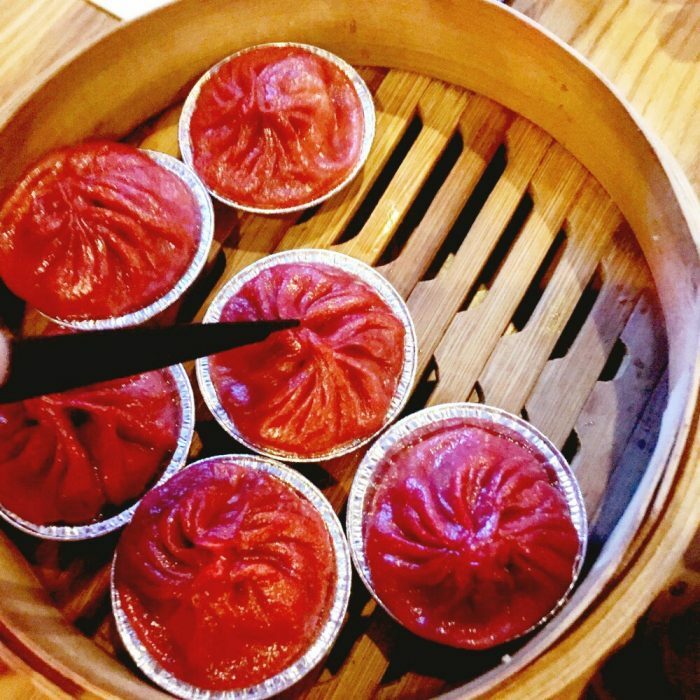 The Tom Yum Goong Xiao Long Bao were a highlight – filled with pork belly, shrimp and coconut milk and wrapped in a beet skin – they were almost too pretty to eat! There’s a wide variety of dumplings and noodles, but I only had eyes for the Giant Xiao Long Bao and in case you’re wondering how you eat it, it comes with one giant straw and it’s definitely not made for sharing which suited me just fine! 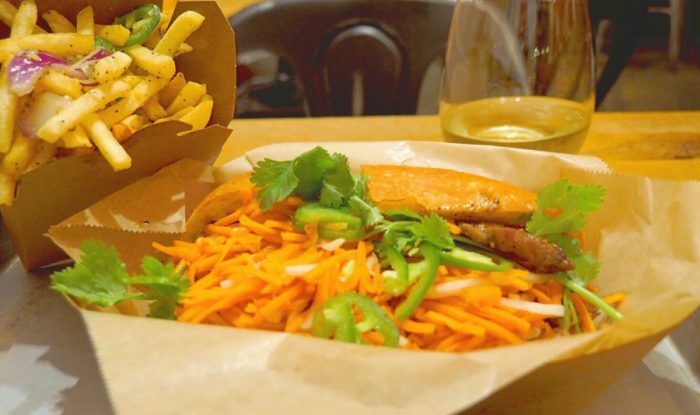 If you like delicious Banh Mi served with a side of hipster, then this is the place you want to be. Bun Mee is super popular at lunchtime and it’s open til 8pm so great for a casual, early dinner too. My Bun Mee Combo (although a little heavy on the grated carrot) and the side of Salt n Pepper Garlic Fries did not disappoint. There’s salad bowls and sandwiches here plus a mouth watering array of sides. Also, happy Hour runs every day Monday through Friday from 3-6pm with great deals on booze and bites. Run, don’t walk. Here you’ll find a mouth watering fusion of French, Southern and Creole cuisines in a relaxed airy atmosphere. 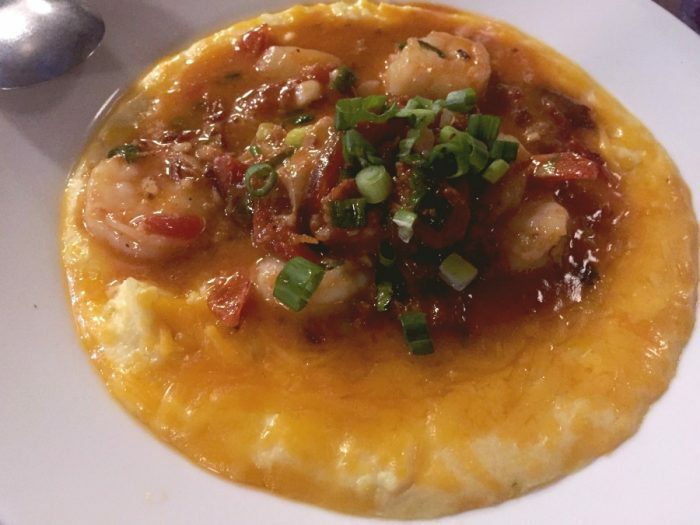 Beignets, po’boys and fried chicken and let’s not forget the shrimp and grits. This place is crazy popular for brunch but it’s just as delicious at dinner. The savoury beignets were a sight to behold and the fried chicken left me with a severe case of food envy. There are no reservations here so get in quick to get your table. 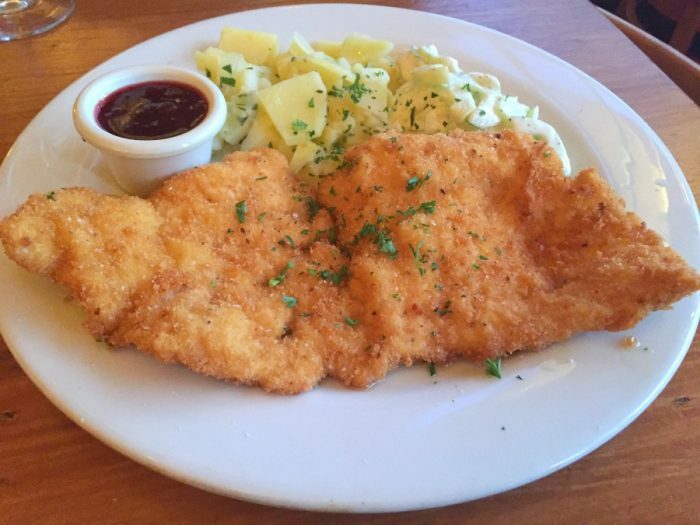 Channel your inner Austrian at Leopolds where the decor is a la Alpine Lodge, the waitresses are dressed in traditional dirndls and meals are hearty . The food selection is much smaller than the beer, which can be served from 0.2 litres to a 5 litre mug… For realz. 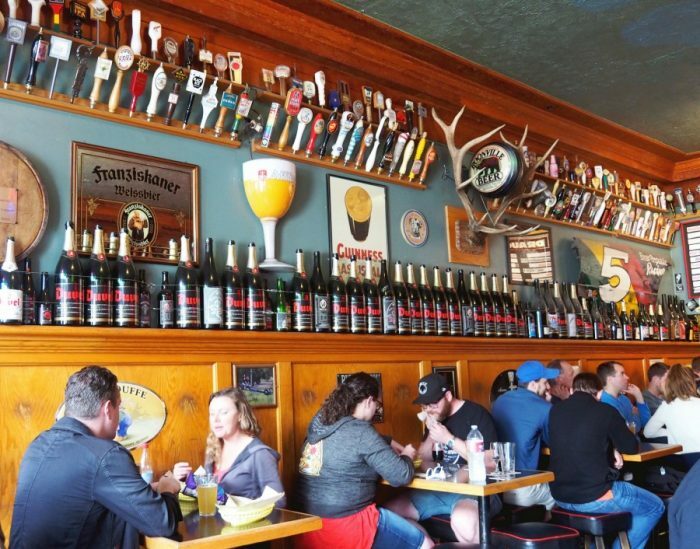 The restaurant can accommodate large groups and when there’s that much beer and that many people involved, be prepare for some bonhomie and some noise. Have you ever been to San Francisco? Got anything to add to the list? Which of these delicious delights tickle your fancy? All food, drinks and baked goods were thoroughly enjoyed and independently paid for.